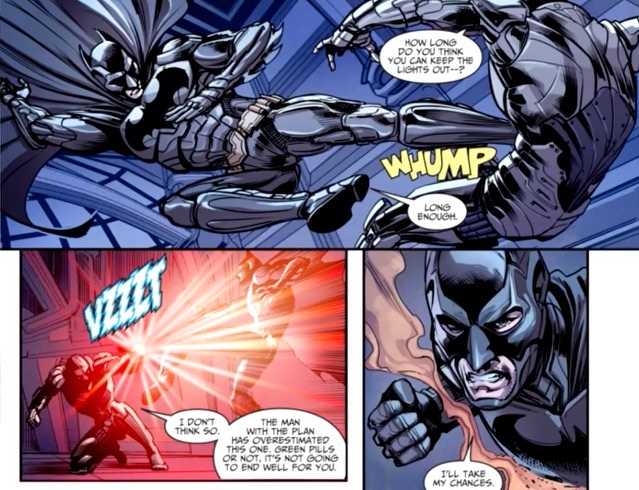 Batman and Batwoman defeat Cyborg and Hawkwoman in combat, and are about to abscond with Cyborg, when Regime Superman arrives and stops their escape. However, Hawkman arrives with a Kryptonite mace, changing the scenario yet again. Story - 3: Readers have been told that Batman and the Insurgency are out of the green pill. However, little other than that little deus ex machina can explain a fight scene like the one below. 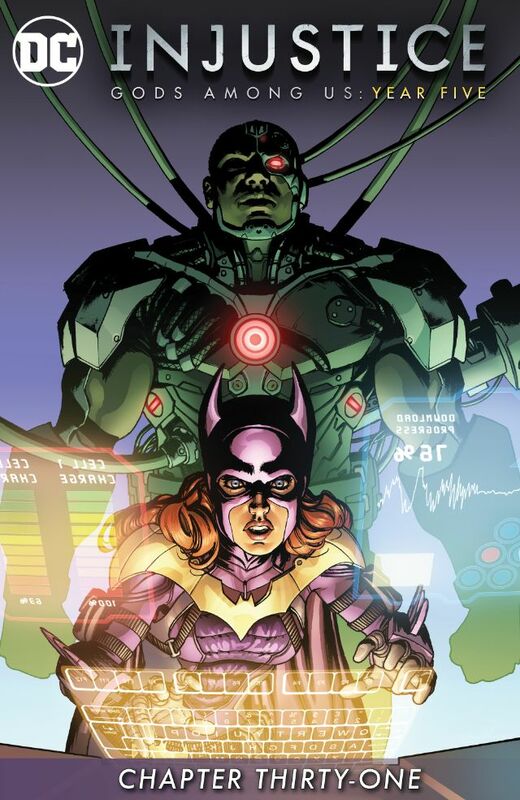 Unless he's been enhanced, Batman has little hope of moving Cyborg, with his obvious strength, let alone weight. The scene is made further execrable with Cyborg responding with a putrid light show, that accomplishes absolutely nothing. Obviously, Cyborg doesn't to win this battle, hence why he doesn't Batman with something substantial, something more akin to what he took him down with just a few issues ago, but where would be the frustration in that? What's more, is the entertainment value of Injustice, Gods Among Us so irrelevant to readers, that they will accept serving after serving of contempt... it would appear so. So long as sales are healthy, they will be no improvement for the story, and flagging sales would result only in cancellation. While even roundabout can be enjoyable, Injustice, this is completely nauseating. 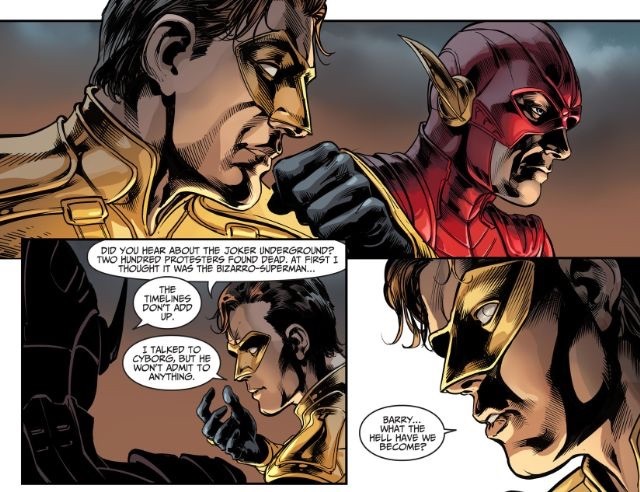 Art - 4: Barry and Hal's short conversation is depicted very well. The mood between them is rendered with shadow and light, but look at the eyes. Barry's is leaden, and Hal's is an almost soulless stare into nothing. The discussion is pablum, as we're really not given a reason for either of them staying, aside of the diaphanous direction of the series, and it would make for great reading to see this aspect of the story explored with the gravitas it deserves.